Buddhism and Feng Shui are inextricably entwined, and Feng Shui is very much a tool to help obtain the kind of peace and self-healing that is the goal of Buddhism. It is therefore not surprising that the Dalai Llama has a keen interest in Feng Shui and the Feng Shui Compass. Before we delve into the use of the Feng Shui Compass, we'll say a few words about Feng Shui itself and its role in the world today. We will also discuss the energies we are directing by the use of the Feng Shui Compass. Feng Shui, which literally translates into ‘wind’ and ‘water,’ is an ancient art combining science and spirituality. It originated in China over 3,000 years ago. The practice of Feng Shui involves understanding and correcting the placement of everything in your environment, usually using a Feng Shui Compass. This means designing your space to optimize balance and harmony between energy in your surroundings and your own energy. In short, the goal of Feng Shui is the art and practice of living in harmony with your environment to produce tangible results naturally. To achieve this we rely on a Feng Shui compass to interpret the layout and flow of chi (life energy). This means that we have a basis for our positioning of everything else. Many people who enjoy and appreciate science understand and are thrilled that living beings are not just accidental collections of particles. We are not merely the material creations of accident and evolution. Humans and all living creatures are living, interconnected spiritual creatures. We do not warm ourselves only in the radiance of the Sun. We are bathed in the positive and negative energy projected by every tree and animal and most human beings. Applying Feng Shui principles in our homes using a Feng Shui Compass, clears the mind in an amazing way. It leaves our thoughts crystal clear. Despair can become hope and unhappiness can become real optimism because we have moved into a world of positive energies. The practice of Feng Shui is based on two main principles that are necessary to attain balance. The first principle is achieving yin and yang. The second is balancing the elements: wood, fire, water, metal and earth. The ideal is to balance your inner world and desires with your outer environment. Feng Shui represent the energy both positive and negative of you and everything around you.. When both of these sides have equal forces that push and pull, you can experience the balance and peace that comes with it. The Yin and Yang symbol is seen as a black and white swirling circle with dots of the opposite color on each side. This points to the fact that you need a balance of energies to generate peace and clarity. This is one of the great themes in Feng Shui because balance is everything. Another part of Feng Shui that’s necessary to obtain balance is the principle of the five elements. You’ve probably heard of the elements as being wood, fire, metal, water, and earth. All of these elements must work together and give prosperity to the next in a natural sequence. For instance, wood feeds fire and warmth - but each is equally capable of giving harm because too much fire burns just as too little starves us. Using a Feng Shui compass guides us in balancing the amount of these forces. It also permits us to balance Yin and Yang, allowing a natural energy flow into a person’s home. When we use a Feng Shui Compass properly, it makes it much easier and simple to position objects in our home. in turn, this creates a tremendous stream of energy that is balanced and wholesome. What are the energies of Feng Shui? To use a Luo Pan compass (Feng Shui Compass) effectively, we must begin to understand the energies at work when we use Feng Shui. These are very different to the energies of physics because they operate on mind and consciousness and spirit and not on the material world of matter. This is exactly why the ancients - and many knowledgeable and wise people today recognize the spirit of the ocean and of the sky, the spirit of the mountain and stream and lake. For millennia, these energies would be named as gods and goddesses, but we now recognize them as aspects of nature and of ourselves. Every Feng Shui Compass itself interacts directly with Earth Energy - the Earth's magnetic field. When we have used the Feng Shui Compass properly, we can align and balance all the other energies that govern our peace of mind, clarity of thought and happiness. Mastering Feng Shui theory requires understanding of the five elements as shown in the table below and the graphic above. Here you can see that each element has a basic meaning, a color and a direction. It's the directional aspect that explains the need for a Feng Shui Compass, or Luo Pan. Again, it is the Feng Shui Compass that allows us to align all these energies correctly. Feng Shui can be very confusing to the beginner because of the many different methods or styles - also called "schools" of Feng Shui. There are quick and easy ways to do it or you can go the more classical and complex route. But whichever method you choose remember that all the methods still adhere to the key concepts of chi, the five elements and the 8 trigrams. The three primary schools practised today are: #1. Classical Feng Shui, #2. Black Hat Sect Feng Shui and #3. New Age or Modern Feng Shui. We will go further into the different schools in a later article. Classical Feng Shui has two sub-systems: Compass School and Form School and in this article we will deal with the first one - The Compass School, which is concerned with the use of the Feng Shui Compass. As the name suggests, the Compass School make use of the Feng Shui or Luo Pan Compass pictured below. Is the Feng Shui Compass hard to use? Don't be intimidated by the complexity of the tool - it's quite easy to use for basic Feng Shui, even for a learner. As you grow accustomed to the Feng Shui Compass, your expertise will grow and you will be able to master more complex operations that will optimize your home and office for clear thinking and a peaceful mind. Like a normal compass, a Luo Pan or Feng Shui Compass indicates direction using the Earth's magnetic field. The key difference is the Feng Shui formulas that are embedded in up to 40 concentric rings on the surface around the magnetic needle element in the middle. This outer surface is a metal or wooden plate called the heaven dial. The Heaven Dial always sits on a wooden base called the earth plate. The heaven dial rotates freely on the earth plate. Compass School focuses on abstract energies and requires the use of calculations and formula to design a building so that its occupants can benefit from the positive flow of Qi. (Compass School can be divided into Yin House and Yang House. Yin House represents burial sites and Yang House represents residences or businesses.) A Luo Pan (Feng Shui Compass) is usually marked up for 24 directions. This translates to 15 degrees per directional segment. This is because our Sun takes just over 15 days to travel through a solar term, which is a series of 24 points on the ecliptic. Since there are 360 degrees on the Luo Pan and approximately 365 days in a year, each degree on the compass is around one day on Earth. It is important to note that Qi has quick and short-term effects, prompting the Feng Shui fortune of a house to continuously change as time passes. Note that the needle of a Luo Pan (Feng Shui Compass) points to the South and not the North.The Chinese word for the compass translates to needle that points to the South. Of course, it aligns itself in the normal way any compass does, but the coloring on the needle is reversed. Be aware of this at all times! Also be aware, when we talk of 'North' we always mean Magnetic North - not True North! A red wire or thread that crosses the earth plate and heaven dial at 90-degree angles is the Heaven Center Cross Line, or Red Cross Grid Line. This line is used to find the direction and position on the rings. Within the Compass Schools there are various methods to implement Feng Shui. One of which is the Bagua. This system uses the 8 trigrams, colour and the attributes of the 5 elements to designate life aspirations or life sections in your home. A Wolf or a Dog. Looking at the table above, you will realize that there are layers of meaning in each section of the Bagua. We will be writing further analysis of this, but to begin with we suggest that you meditate on each section at a time. It's amazing just how much is revealed by such an exercise as your mind reaches into the collective consciousness and makes new connections. There are many, many 'Eureka!' moments to be enjoyed in this way. Eventually your whole understanding will become entirely intuitive and natural - second nature. Try this to begin with: Using the meditation Guide on this website, quietly put together in your head the concepts of 'North', 'Water', 'Career', a 'river running through a gorge' and 'a pig'. This will make little sense to you at first and may seem absurd, but this is the way mystics of all persuasions have used for millennia, allowing the mind to create its own connections and revealing glimpses of underlying reality. Please try to become familiar with the basics of Feng Shui as outlined above before doing your first reading - you'll get much, much more out of it! Having said that, there is no problem whatsoever in taking your first reading straight away. It's just that your readings and interpretations will get much better as you learn more and more of this fabulous mystical science. There are many questions about how to take a compass reading for Feng Shui. Here are a few of them. 1.Should the reading be done at the front or the back door? 2.Should the door be closed or open? 3.Can you use a regular compass? 4.Should the compass reading be magnetic north and true north? The front door is the where the energy nourishment, or Chi, enters the home. Therefore, this is the door that should be used. Beware that it should be the main or original entrance door and not necessarily the one you use the most. For instance, if you use the garage side door to enter your house, you should still use the main front door to take your reading from. Closed or open door to take Feng Shui Compass readings? For best results you might need to take several readings. Take the first reading inside the home looking out, facing out through the open front door. The next reading you take while standing inside the door, still facing straight out. And the third reading outside the door with your back to the door, in other words still facing the same way. You then calculate the average reading by adding up all the readings and dividing the total number of readings. For example, if you took three readings (33 degrees, 35 degrees, 37 degrees), the average would be: 33 + 35 + 37 + = 105; 105 divided by 3 = 35 degrees. 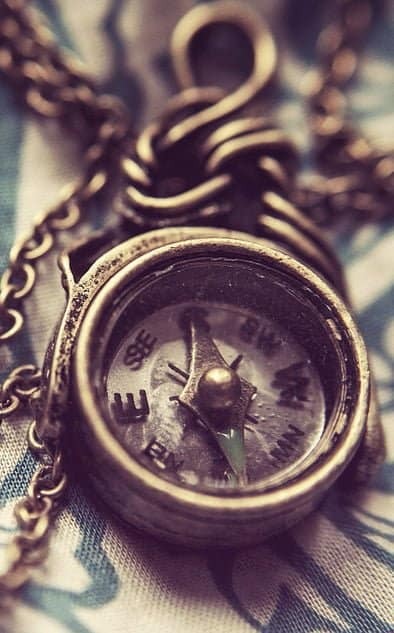 The compass reading may be distorted by a strong presence of iron or steel objects close to you, or if you’re wearing a metal watch, belt, or jewelry. In which case it would be best to remove your watch, belt, and jewelry and move away from the front door to ensure accurate results.. Which Type of Feng Shui Compass to Use? In Classical Feng Shui a traditional magnetic compass (the Luo Pan) is used by serious practitioners. But for the purpose of this article it is perfectly fine to use a standard compass that gives you a degree number from 0 to 359. You can also use your smartphone compass app. If you use a smartphone, check your settings to make sure the ”true north” option is turned off. For feng shui purposes, you only need to know the magnetic north of your front door. There is no need to adjust your reading for the geographic (true) north. In Part Two of this article we will be explaining how to use the information you have now, to create a true Feng-Shui home and office using a Feng Shui Compass. But first, we need to give you a further outline on what you will need. Yes - Feng Shui is complex, but the effort is richly rewarding! Remember that position is the key to everything - and that's why you have your trusty Feng Shui compass and your first reading. You're ready to go! Position your back square to the property facing away from the door. Hold your compass at waist level. Read the compass degree on the indicator line. Take at least 3-5 compass readings from inside and outside your property..
Add all readings up and divide by number of readings. You will now have an accurate facing direction for your property. Using your Feng Shui Compass (Luo Pan) can help you understand which energy is lacking in your home, whether it’s for wealth or happiness. Using this information to get the level of positive energy just right takes some practice and research (which we are helping you with!) because the position of items is key. Once your Feng Shui measurements are complete (and we have only done the first one so far), how you place the sacred objects and statues around your home is a very important detail, as this either welcomes or hinders the presence of good energy in that area. There are some recommended places you can keep special items to achieve a perfectly Feng Shui bedroom, Feng Shui Living Room or Feng Shui office for instance. Understanding and improving the Feng Shui by using a Luo Pan (Feng Shui Compass) takes a lot of time and practice before you see a difference. Many people get frustrated with it if they don’t see immediate results, but Feng Shui isn’t a quick fix. The good news is once you get used to the different ideas, colors, and cures involved, it becomes a lot easier reach the perfect energy and really get the Feng Shui flowing! You can read a more basic explanation of Feng Shui here. In part 2, we'll go into a lot more detail on how to use the Luo Pan (Feng Shui compass). We hope you enjoyed our article and found it useful. If you did, please share it on Facebook using the gray buttons on the left and/or leave a comment below. THANK YOU for visiting us. The dragon figure symbolizes strength, fertility, wealth, and power, so it’s definitely a figure that can do a lot for the energy in any room. Placing the dragon and a phoenix in a Feng Shui bedroom can help to recreate a connection and increase love in a marriage. To achieve a Feng Shui office, put your dragon statue behind you so that its effects can help support you, rather than in front of you where its energy becomes an opposing force for you. We will consider which way the Dragon must face in part 2 of this article. Chinese coins are a must-have for anyone who’s interested in increasing the profit of their business and market value. Keeping these brass or bronze coins in areas of wealth and high business is a good idea to attract energy that can increase this. Some recommended places to keep your coins for positive vibes would be where you stash your valuables, near your safe, or in an area where you receive and handle money, like a cash register. These coins can help purify incoming wealth and add blessings to the existing one. The laughing Buddha is another vital decoration to include in your Feng Shui Bagua. This piece attracts good luck and fortune to your home, so it’s a good idea to keep it in an area where you usually handle money, like a safe. You can put the laughing Buddha statue anywhere, as long as it’s not in an enclosed room, like a bathroom. To respect the laughing Buddha statue and get the most energy flow, you should keep it in an area that’s above ground, but not over eye-level if possible. Crystals are one of the most adaptable items to increase the good Feng Shui in your home. They can be used to attract and focus many different kinds of good energy. For example, you can keep a few pieces of hematite in your room to calm yourself if you’re having trouble concentrating or relaxing. Crystals like obsidian and black tourmaline are effective for protection, while clear quartz is known to increase the effects of other crystals in general. These crystals can go pretty much anywhere in your home because of their versatility as long as you cleanse their energy regularly. This helps to keep the crystals light and free of any negative energy they absorb. Crystal trees are similar to crystals, except that they have a collection of different crystals all working together on one tree. This is a great way to maximize effectiveness while using minimal space and time in decorating. An interesting note here is that it doesn’t necessarily matter how much bling you have on the tree; what matters more is the type of rock you have, not the shine. Even Swarovski crystals don’t do much for energy, despite their dazzling brilliance. Crystal trees work best when they’re placed in open areas like a living room or open office. To achieve optimum Feng Shui bed placement for more personal areas, crystal trees can be included nearby to supplement that energy and increase its reach. The bagua of an area is basically what we use to understand the energy in that area. Think of it as an energy map. As the bagua for every room is different, you may have different bagua maps for different parts of your house. The trick with good bagua is to align it with your floor plan based on where the energy levels are flowing the most. For example, you want to place items that increase your wealth in the section of your house that’s lacking that energy to compensate for it.